Sherry FitzGerald is offering this wonderful detached family home to the market for sale by private treaty in Ballymanagh, Craughwell, Co Galway, an excellent location close to the local primary school, church, and Craughwell village, which provides shops and services including bus and rail transport. Size is 231 sq m (2,486 sq ft ) approximately. The accommodation includes sitting room, open plan kitchen/dining/living/sun room, study/fifth bedroom with en suite, utility, and guest wc on the ground floor. There are four bedrooms on the first floor with one en suite and main bathroom. The master bedroom has sliding wardrobes and all other bedrooms have storage/walk-in wardrobes. The bedrooms to the rear of the property boast double Velux windows inset to the roof, giving an abundance of light. The BER is C2 on BER cert no 110315165, with an energy performance indicator 186.63kWh/sq m/yr. Externally the property boasts a large site totalling c0.69 acre, with winding tarmac drive and gated wall boundary to front. Mature gardens provide privacy to the brick laid patio area at the front of the property and further al fresco dining area to the rear with outdoor pizza oven, concrete patio, and paths. The property also includes a large garage. Loughrea and Athenry towns are accessible within 11km of the property, with access to the M6 Galway/Dublin motorway from here. 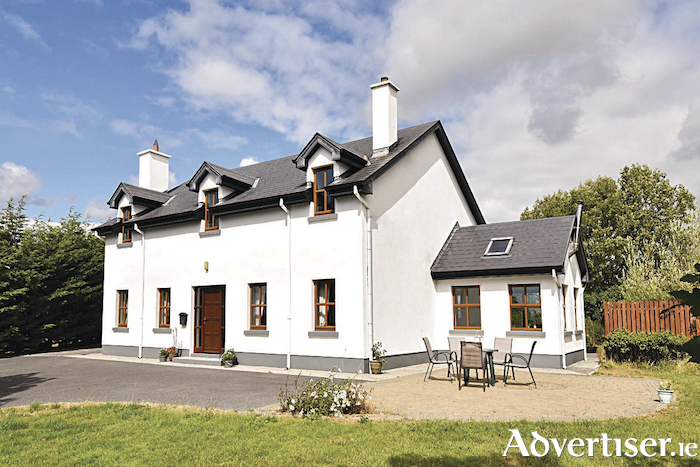 Asking price is €345,000. This is a lovely family home and a viewing is strongly recommended. Viewing is by appointment with John Clohessy, Sherry FitzGerald, One Galway Central, Forster Street, Galway, 091 569 123/087 973 9967 or [email protected].